Daniel: After college, I secured a job with a commercial digital print firm which was riding the wave generated by the transition from traditional printing technology to digital. This led to my first foray into my own business ownership, when I acquired a print firm in administration in France. After a few years of rough and tumble in the French commercial world I transitioned into a start up raising £9m on the AIM market to provide aggregated online procurement services during the dot com boom. I subsequently sold the software arm of this company to a competitor and moved with the firm rising to become the Chief Operations Officer. With that company sold I moved into the management of a software development business in South East Asia which necessitated a large amount of travelling. This ultimately provided the impetus to create our own business back in Ireland. Geraldine: I studied Art History at the Ecole du Louvre, specialising in Christian Iconography. When we married and moved to London I worked for Auction houses (including Sotheby’s)and trained to be a bookbinder. When I had my first child, I set up my bookbinding business from home. I took that business with me when we moved to Ireland in 2007 and had the privilege of being part of the West Cork Craft and Design Guild patroned by Jeremy Irons. I then started to hand paint my Japanese papers to create unique pieces. In 2010, the combination of the arrival of our 3rdchild, the recession and Daniel needing help to start Stonewell Cider put an end to my art and craft career. I am now part of the business full time, looking after the accounts, HR, PR, various other tasks and whatever else needs doing (while looking after the family!). From the top line perspective, Stonewell certainly couldn’t be perceived as logical progression. However, a number of non-professional experiences did influence our choice of sector. In addition, a lot of the general management skills Daniel acquired through his previous work experience and Geraldine’s family background in wine-making have been invaluable as we have navigated the cider industry and the prevailing trends in micro-cidery production. Why did you get into cider? What tips would you give to others thinking of launching their business? It is a very personal thing. Most of all for us, it is about upholding a commitment to quality and believing in our own value – no matter what pressures are brought to bear. After that we would say that good market information and detailed business planning is key. What are the pros and cons of being based in Kinsale? Kinsale has great brand recognition. It’s a destination that a lot of people are familiar with. It’s also in the heart of south Cork, which is a hotbed of culinary innovation and expertise. This creates an exciting environment where food producers can share ideas and experiences. From the downside perspective it would be the lack of infrastructure, be it broadband, the road network or public transport, all of which could do with a lift. In light of our desire to expand overseas the fact the Cork airport doesn’t have the widest choice of destinations does make one slightly loath the trip up the M8 to Dublin! Irish Cider needs to be separated into industrial and real cider producers. The industrial ciders are no different from those produced in the other major markets of cider consumption. However, Stonewell was effectively the first real cider maker in the modern era. Along with its competitors it’s had the opportunity to work from a blank sheet of paper as the last regional cider maker, (Power’s of Dungarvan) went out of business in the 1960’s. This meant that we have none of the baggage of pre-conceived notions as to how cider should be made, what its characteristics must be and so forth. As a result I believe that the majority of Irish real cider producers are approaching their production with much more of a wine fermentation approach. This differs from what one might find in Normandy, Brittanny or Western England because it identifies and seeks to overcome faults within a juice or a fermentation to provide a very refined clean cider. What are the main challenges facing real cider makers in Ireland? The duty rate and the dead hand of government. The former is the second highest rate in the EU and for the purposes of comparison, in Ireland a litre of cider < 6% ABV is subject to €0.95 of duty, whereas in France it is just €0.02. Certain sectors misguidedly believe that duty increases diminish abusive alcohol consumption. All things being equal this would be the case, however, until the government prevents below cost selling multiples will continue to discount alcohol which is the main facilitator for abusive drinking. In the meantime this is a substantial barrier to people who want to enter the real cider making market in Ireland; in addition to the efficiencies of scale enjoyed by industrial brands it makes the market very one sided. Enabling small producers of alcohol to sell the products they produce. At present cider makers, like brewers and distilleries, cannot sell their wares at festivals or markets and nor can they sell directly to the end consumer. Given that micro producers will always be priced at the premium end of the market the government’s argument that such a licence would facilitate access to alcohol rings a little hollow. Effectively supervise and prevent abusive market practices by large industrial brands. Stonewell has been removed from accounts in Ireland when major industrial brands have offered a large quantity of free stock to ensure our removal. Properly police labelling and marketing activities. There is ample evidence, whether it be scam localised brands of lager made by large producers or brands importing product from abroad and peddling it as Irish, to demonstrate that this is a significant problem. From the consumer’s perspective it is very often difficult to spot the wood from the trees. These are exciting times. Cider is following in the footsteps of the micro-brewery revolution. There is however one major difference. It is a beverage which is far less ubiquitous than beer. As a result, not only are existing cider markets available for growth in this sector but so are virgin territories. This is why we see Carlsberg, Heineken, etc. expending large sums to launch cider as a sector in places like Portugal & Italy. This creates an enormous opportunity to benefit from their slip stream. 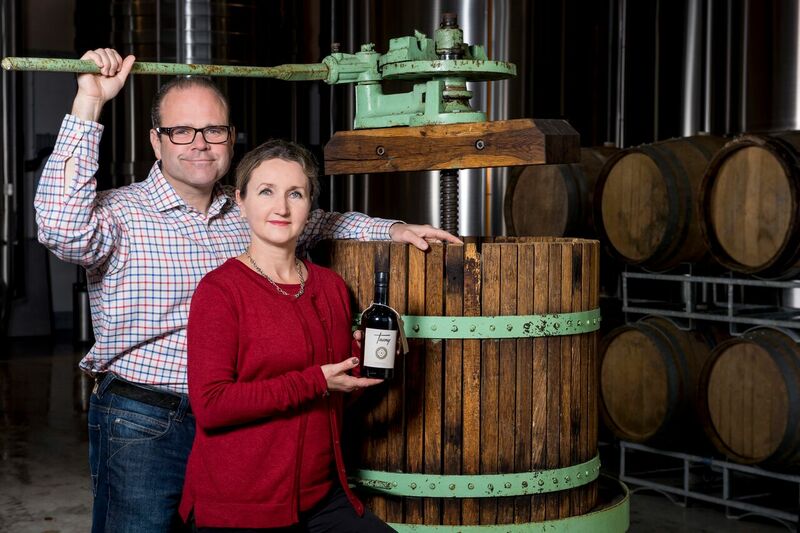 As a result we are looking to continue to grow domestically, innovating with new products and introducing consumers to the full Stonewell range (Dry, Medium Dry and low alcohol-Tobairín) and our small batch Tawny (a rich opulent viscous, dry-hopped cider). We also produce Esterrre, a sparkling prestige drink that compares to Prosecco. Of equal importance is to expand our exports. Following our contract with Carlsberg France we are looking to replicate this across multiple overseas markets and secure in excess of 50% of our sales by volume outside the State. What is New at Stonewell? We have just produced our second ever batch of our seasonal rhubarb cider, Stonewell Rós. Last year it won the Blas na hEireann Supreme Champion award at the Blas na hEireann Irish Food Awards. Next ArticleFemale Entrepreneurs….You are no longer alone.